Have you ever wanted to simply escape the worries and stresses of your day-to-day life and just be pampered and indulged? Well how about in Fiji? In Fiji, you can find your very own spa sanctuary, at a very affordable price, and spend endless calm, sunny days just relaxing, rejuvenating, and treating your mind, soul, and body. To help you find the best spa treatments for your next relaxing escape, Phillipa Steele, International Model and Fiji Airways Ambassador shares her local recommendations on the most luxurious spa treatments in Fiji. Located at Natadola Bay, just an hour’s drive south from Nadi Airport on the main Island of Viti Levu, the Intercontinental Resort & Spa is your own little slice of heaven. With an infinity pool for adults, day beds, cabanas, and a pristine white sandy beach, your luxurious spa treatments will be the icing on the cake. What I loved about the Intercontinental is that my spa treatment took place in a beautiful beachfront suite and I had my very own private outdoor tub, it was pure luxury! Their signature Warm Shell Massage is beautiful and their Pure Romance Ritual that includes a traditional sugar cane and coconut body polish, an essential oil body wrap, and a rejuvenating facial is just the start of your relaxing journey. Located at Savusavu on Vanua Levu, an hour’s flight from Nadi Airport on the main Island, the Koro Sun Resort & Rainforest Spa offers an authentic Fijian experience. With stunning ocean views, a private beach, and luxurious spa treatments, the Rainforest Spa resort offers romance, peace, relaxation, and indulgence in spades. Try their signature Banana Leaf Body Wrap (the leaves are grown in their own grove), their sensational body scrub using coconut shavings from a nearby plantation, and their Papaya Enzyme Facial to soften and revitalise your skin. Also located at Savusavu on Vanua Levu, the Namale Spa & Sanctuary is a world renowned haven for rest and relaxation, perched on volcanic cliffs with stunning ocean views. Their Spa treatments are inspired by their ancient healing traditions and their Spa is made from native materials and a palm thatch. You have hot tubs, steam rooms, plunge pools, dipping pools and a waterfall massage, all overlooking the fabulous ocean and Namale blowhole. 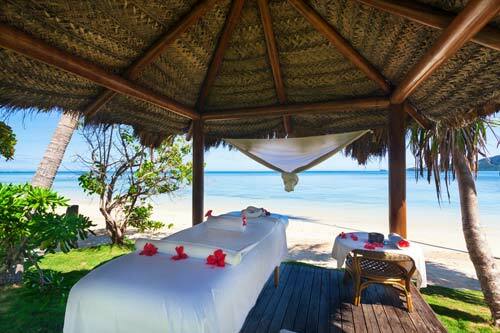 Try their signature Hot Stone Massage, Namale Tandem Massage, Balinese, or Fijian Bobo Massage in your own Bure, on the beach, on a private deck, or in the lush gardens. Located on a private island, just off Pacific Harbour, Royal Davui Island Resort is a 20-minute flight from Nadu Airport, followed by a 30-minute fast launch ride. This is an exclusive, adults only sanctuary situated in the stunning Beqa Lagoon, offering unparalleled privacy and luxury. You have stunning views of the lagoon and reef from your private villa, your own plunge pool, open air shower, and a Jacuzzi. Their Spa treatments are inspired by ancient Fijian traditions, using exotic nuts and floral extracts, coconut milk and coconut oil. Both your mind and body will be relaxed, rejuvenated and serenely renewed in this Island paradise. When I return to Fiji from 6 months of travelling around the world, the first thing I do is book myself into a spa treatment. It’s the best way to unwind, relax and de-stress. After all, you deserve it and your mind and body will thank you for it. **Phillipa Steele is a Fijian model working internationally and a Brand Ambassador for Fiji Airways. Phillipa is half Fijian and the other half is made up of Tongan, French, English and American and is based in Sigatoka, Fiji. For 6 months of the year Phillipa is travelling to New York, France and Switzerland where she models for some of the world’s top fashion brands. Follow her on Facebook or Instagram. Founded in 1951, Fiji Airways Group comprises of Fiji Airways, Fiji’s National Airline and its subsidiaries: Fiji Link, its domestic and regional carrier, Pacific Call Comm Ltd, and a 38.75% stake in the Sofitel Fiji Resort & Spa on Denarau Island, Nadi. Fiji Airways aims to be the leading global boutique airline, and has a fleet of brand new wide body A330s and refreshed B737 aircrafts. Fiji Link has a fleet of ATR 72, ATR42 and DHC-6 Twin Otter aircraft. From its hub at Nadi International Airport, Fiji Airways and Fiji Link serve 48 destinations in 12 countries (including code-share). Destinations include Australia, New Zealand, USA, Hong Kong, Singapore, Samoa, Tonga, Tuvalu, Kiribati, Vanuatu and Solomon Islands. The Fiji Airways Group brings in 64 percent of all visitors who fly to Fiji, employs over 1000 employees, earn revenues of over FJD$769 million ($372m USD$), and directly contribute a significant portion of the country’s Gross Domestic Product (GDP). Fiji Airways rebranded from Air Pacific in June 2013. 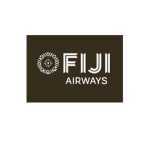 Visit www.fijiairways.com for more information.